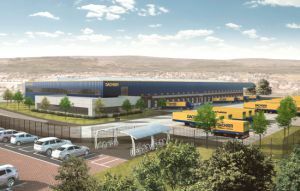 Dachser UK is to build a new 5,175sq m logistics centre in Rochdale to replace its existing distribution facility – a €16 million (£14.4 million) investment. Located on the Kingsway Business Park adjacent to the M62 junction 21, it will have 49 dock loading doors and an additional four level access doors. There will be an internal area of nearly 7,000 square metres, including office space. Business has grown fivefold since the acquisition of JA Leach Transport in 2010, whose premises are Dachser’s current base in the North of England. Dachser UK managing director, Mark Rollinson said: “Our significant investment is evidence of Dachser’s commitment to the UK market and our optimistic view on the future of both import and export trade with the rest of Europe. Some 106 of Dachser UK’s current 448-strong workforce are based in Rochdale where the company expects to create many more jobs over the next five years.